The News We’ve Been Waiting for: “Gene Therapy Program for Rett Syndrome will be advanced by biotech company.” Last week RSRT sent out an email announcing they will be going to a Gene therapy trial for Rett. Reading those words took my breath away. I froze for a moment. My hands were shaking. Since Maggie was diagnosed, I had hoped I would read those words one day. Rett Syndrome will be going to gene therapy trials. Its not if, its when. That is huge. As always, thank you for being our support. We are not there yet, and we will need more help. But we will get there, with a little bit of pixie dust. There is so much hope. Take the time to read the initial press release here. It is worth it. This entry was posted in Uncategorized and tagged cure, gene, hope, Magnolia, research, rett, reverse, syndrome, therapy, trial, trust. Bookmark the permalink. What a wonderful message!! Lots of prayers for Maggie and your whole family. first of all, how is Magnolia doing these days ? I can’t tell you how impressed I am by her courage and your dedication. I can only beging to imagine how hard this journey has been for you and your sweet girl. 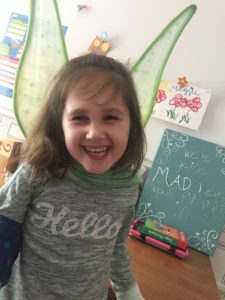 I came across your videos on youtube and then this blog randomly, as i was searching for answers about my own daughter. I don’t know if she has RTT (I hope not) but she’s delayed and doctors keep brushing my concerns off. She sat, crawled and walked late (8, 11 and 18 months respectively). At 20 months, she’s still very wobbly, doesn’t seem to have a lot of balance and only has 30 words (many approximations). Her receptive language is all over the place, sometimes she seems to get evrything you say and other times, she doesn’t. around (like she’s carressing the chair, her cup…). She also seems to be dropping things more often (they sleep out of her hand) and i can’t tell if it’s normal or not. i’m not asking you to diagnose my daughter online but i’ve been reading a lot of blogs and forums about RTT lately. I’m trying to figure out if I’m being overly anxious or if should push for more testing of my girl. Could you please tell me when you first tought Maggie had an issue ? What were her delays then ? Thanks for reaching out. I’m happy you found us. The first indication of an issue for us was a loss of speech. She was speaking two word sentences and then slowly wasn’t using any of the words that she had learned. When those words weren’t coming back, we started investigating more. We saw a developmental pediatrician who recommended blood tests and one of those blood tests was for Rett. It wasn’t really until after that that her hand wringing, breathing issues, and balance started to regress. I would continue to search for answers if I was you, but a doctor once told us that “labels are for cans not for kids”. If it does end up being Rett, know that there is a lot of reason to be optimistic about her future, and that you’re not alone.